The Ministry of finance has opined that the fear about government missing the fiscal deficit target for the current financial year is unwarranted. The argument of government not meeting the fiscal deficit target came in forefront when the government announced an extra Rs 52,872 crore for the second half of the 2011-12, which started from October 1. Many experts have the view that the government borrowing may touch Rs 1 lakh crore. The government is presently aiming to borrow Rs 4.70 lakh crore compared to the budgeted Rs 4.17 lakh crore. 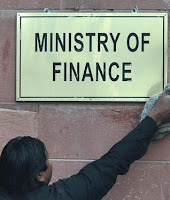 For the 2011-12, the government has estimated its fiscal deficit target at 4.6% of the Gross Domestic Product (GDP) however, private rating agencies such as Moodys’ has the view that the fiscal deficit would be around 5% or 5.5 to 6%.